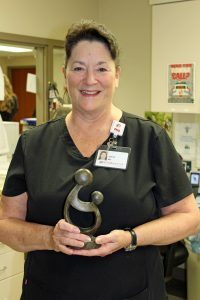 DAISY honoree Joy Rogers, RN, pictured with her Healer’s Touch sculpture. A nurse at Parkwest Medical Center was honored this morning with The DAISY Award for Extraordinary Nurses. The award is part of the DAISY Foundation’s program to recognize the super-human efforts nurses perform every day. The DAISY Award was established in 1999 by the family of a patient who had received extraordinary care and compassion from his nurses during his final days. Parkwest has two honorees for August. Joy Rogers, RN, on 2 Montvue was honored this morning, while Drew Everhart, RN, Float Pool, was honored last week. 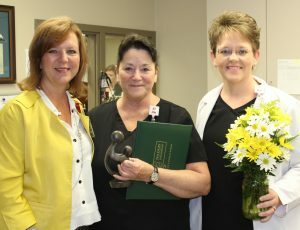 Chief nursing officer Lynn Cagle presented Joy’s DAISY award this morning. Here Lynn and Joy are pictured with Joy’s nurse manager Donita Beard. Joy was nominated by a patient’s daughter, Mindy McNaugher. Here’s what she had to say about Joy, “I feel compelled to write to you concerning my Dad’s recent stay in your Critical Care Department, and ultimately his passing on your palliative care floor. My dad is from Pittsburgh, and had been fighting Myelodysplastic Syndrome for some time, but had permission to travel to Knoxville for a grandson’s wedding. While there, Dad became critically ill and was brought to Parkwest. My Dad’s immune system was so compromised from his cancer that ultimately he could not overcome his double pneumonia. We had two nurses that went so far beyond their “duties” in their care of my Dad, and their compassion and heart for us, his family, that I felt the need to thank them both by bringing them to your attention. You have two phenomenal “angels” on your staff! Once my Dad was transferred to your hospice floor, we were greeted by another angel on your staff, Joy Rogers. Again, words are so inadequate to describe what Joy gave to my Dad, my sisters, my niece and me that night as we watched my Dad pass. Joy’s heart, her compassion, her skills, her patience in explaining to us what would happen, her gentle kindness goes beyond words. Joy was such a comfort and strength to us as we watched our Dad leave this world, and enter into Heaven. Living in Pittsburgh, we have many great hospitals, doctors and nurses, but my heart has NEVER been touched by two such extraordinary people/nurses. I have never felt compelled to write about any specific nurse in all of my Dad’s hospitalizations. You have two very special treasures there at Parkwest. Joy will forever hold a special place in my heart, and in the heart of my family. We were so blessed to have had these two special individuals care for my Dad, and be by our side through and extremely difficult and emotional time. The DAISY Committee presented Joy with a pin, a certificate, daisies, The Healer’s Touch sculpture, and cinnamon rolls for her entire department to share. Congratulations to Joy! We appreciate her passion for nursing, and her commitment to always putting her patients first!